So, you’ve decided to take up the great vintage art of swing dancing. First off, welcome. We’re very glad to have you. This is a new series geared towards offering advice to dancers fresh out of their first free beginner class. We’d like to begin, simply enough, with a few basic things we think you should know as you begin taking classes, going social dancing, and calling the scene your new home. 1. If it feels cool and is comfortable, it’s legal. We mention this often in our beginner classes: What occasionally happens is, we teach a move, and the students accidentally end up doing something else…but what they do works as a move. When this happens, we tell our students that even though they didn’t do the move we were teaching, they proved a great point about swing dancing: that as long as it’s comfortable, and it feels cool, it’s legal. That is, after all, how many great swing moves are invented. 2. You can break almost every swing dance “rule” if you have a good reason. This one is not going to be too important for you at the beginning, but we think it’s good to know as a student. It looks at the above tip from a different angle. You will be reminded of this often: Your instructor might say “don’t do this…” and then someday you’ll see someone doing that very thing, but perhaps in a cool way that works. This is part of jazz music, creativity, and individuality in general — there are very few dead-set rules that can’t be bent or broken if done so in a purposeful way. (Or, I guess, an accidentally cool way. But let’s strive for purposeful.) Also, make it a goal to master whatever rule it is before you try breaking it, or at least to understand exactly why you’re breaking it. What are examples of rules that can’t be broken, ever? Our nominees are “Dance to the music” and “Strive to give your partner a comfortable dance.” We don’t think those can ever be broken in a way that makes it worth it. Hence, if it feels cool and is comfortable, it’s legal. 3. Mostly, it’s about listening. Swing dancing can mean a lot of different things to a lot of different people. It is capable of great solo expression, great conversational expression among partners, and great expression of jazz music, overall. The key to being able to do any of that is to first listen. When you dance, listen to the music, and “listen” to your partner — pay attention to how they feel and what they are doing visually. That step should never change, no matter what level of dancer you become. 4. 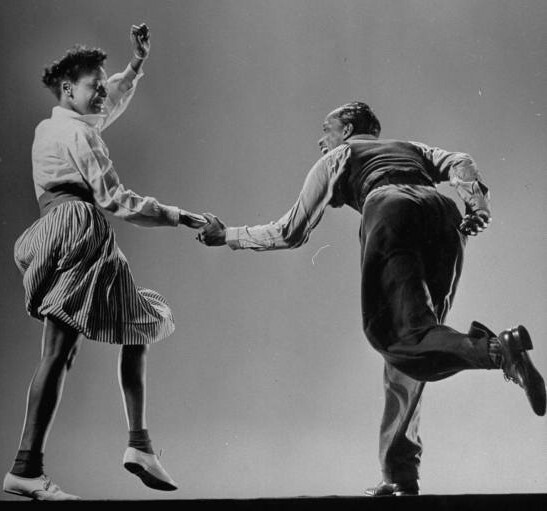 Your happiness in swing dancing is in your own hands (and feet). Though the swing scene is an incredibly welcoming place, it is ultimately your responsibility to get what you want out of it. If you want to be good at swing dancing, practice. If you want to dance with this or that person, ask them. If you want to get to know that group of people, introduce yourself. A great step for beginners is to set goals for themselves. For instance, you might make it a goal to practice fifteen minutes a day for a week. You might make it a goal to have a conversation with a new person every dance night, and to ask at least one person to dance whom you’re nervous about asking. We’d also recommend that you make it a goal to smile twice per dance at the people you’re dancing with. (Especially the one you’re nervous dancing with.) Trust us, it will help. This also means that you may have to occasionally remind yourself what does make you happy. As you go through swing dancing, you may find frustrations in the learning process, or other places, and in those times, reminding yourself that it’s supposed to be fun is important. Things that will help: reminding yourself that there are friends out there in the scene, that there is fantastic music, that there is almost always someone you can dance with who will help make you smile. You are the one most responsible for your happiness in Swing dancing. There are many different ways to swing dance. You are allowed to come up with your own. I especially like the part about setting goals when it comes asking people to dance. When I started I out I was VERY shy about asking people to dance. I would set a goal of asking at least 3 people per night and was happy when I made my goal. It really helped me get more comfortable. Awesome, I’ve started swing dancing 4 months ago now. Almost every friday I go to social dance nights and do a full circle to dance with as many people as I can. Coming from hip hop and break dance I have a very different approach in general so I have to learn to control the moves I do so they feel right when dancing with a partner(I have a tendency for crazy idea’s). Listening to the music is by far the most important part and I’m glad you emphasize that point it’s been a challenge when you have to consider smiling, not bumping into others and executing moves correctly. I think it’s great that you think it’s okay if a student ends up doing something different than what you teach but works, then it’s okay. My sister got me into swing dancing six months ago, and I really enjoy it, but sometimes I worry that I don’t do it right. My sister wants me to join a West Coast swing dance club, so maybe I should just do whatever I want when we go dancing there.